The Philippine Military Academy, or PMA, is the premier educational institution that trains future officers for the Armed Forces of the Philippines. The PMA can be considered as the Philippine equivalent of the prestigious West Point in the United States. Many PMA alumni have become quite successful in their military careers and several have even gone into politics. No less than four current Senators are alumni of PMA: Gregorio “Gringo” Honasan, Panfilo “Ping” Lacson, Rodolfo Biazon, and the controversial Antonio Trillanes IV. Two other PMA alumni currently serve as Cabinet Secretaries: Leandro Mendoza as Transportation and Communications Secretary and Angelo Reyes as Energy Secretary. 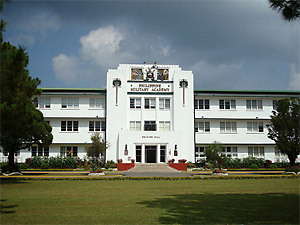 The campus of the Philippine Military Academy can be found in Baguio City in a remote area due south of Loakan Airport. Cadets, as PMA students are called, graduate with degrees in Bachelor of Science with majors in either Engineering, Information Systems, or Management. Students are also colloquially called mistahs and the bond that forms between them can become quite strong, often to the detriment of their other social relationships. You might say that the Philippine Military Academy is actually one big fraternity, thought female cadets have been accepted since 1993. For more information, go and visit the official website.